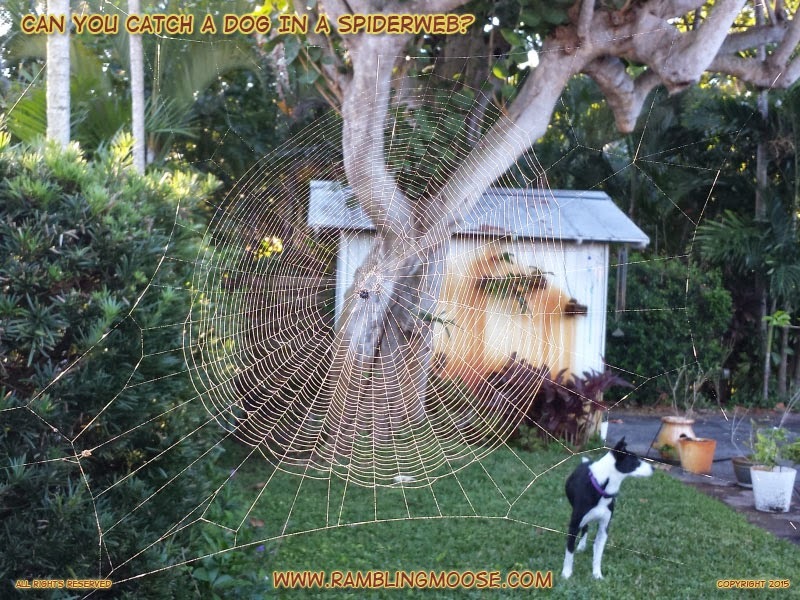 Rambling Moose: Can You Catch A Dog In A Spiderweb? I spotted it from the bedroom, shimmering in the morning sunlight. It was humid with the sun was fighting through the early Marine layer. It was a large spiderweb inhabited by a large crab spider. Giving it some room, I circled to the back to see what I could see. Trying to catch the sun in the water droplets, I had a trick of perspective. It looked like my backyard had been attacked by an arachnid of nuclear proportions. A huge web that threatened to take my shed with it, was threatening my dog, Rack. No, Rack! Don't go there! The Spider will get you! You'll be Crab Food! Seemingly unconcerned about the tricks that my eye were playing, he glanced over at the pool. The Spider didn't care. I was close and it wasn't moving from its place on the opposite side of the web. Its eight eyes were apparently not watching me so much as what was going on at the back of the property with the dog. I sprayed some water onto the web to highlight what nature had started. The water that landed there shimmered green, then white, refracting the sunrise that had been coming into view. Next time, Mr Spider, Next time. I shall leave you to your lair, but you will not molest the dog with your giant web of doom. Come Rack! Inside! Lets go!